- The number of existing market entry barriers. The saturation of the Ukrainian retail market remains one of the lowest in Europe. In this high-quality projects have become more and more. And this year, offering a unique project in many ways - the largest Ukrainian Central City shopping mall Ocean Plaza, the quality of which corresponds to the world standards. At the same time, according to experts, many foreign operators have already studied all the possible obstacles entering the Ukrainian market, put up with them or have learned to overcome them. 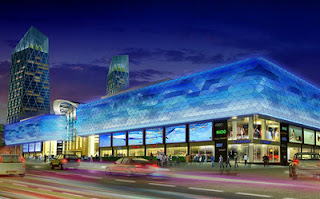 As a result, by the end of this year we will see in the mall about 40 brand new for Ukraine in Ocean Plaza. 60% of new brands will be due to local market operators, who have long been working in Ukraine. 40% of new brands will enter the market independently. The country of origin of franchise leader is Western Europe. A direct investment - the countries that are closer to us and whose investments have long been widely present in Ukraine, Russia, Romania and Turkey. The format for the new Ukrainian brands, according to the experts, about 20% of them – it is food and drink, the other 80% - a fashion brand. It is significant that 30% of new strand brands are goods premium level. Earlier in our country goes no more than one or two of these brands in the year, as they were developed specifically nowhere. In 2012, we see a greater expansion of expensive brands, some of which will be presented on the Bolshaya Vasilkovskaya street, but most - in the SEC Ocean Plaza, where the first in Ukraine to be established premium gallery. According to experts, massive entering of foreign retailers in the Ukraine market is also due to the active and long process of creating a positive image of our country and the promotion of Ukrainian projects on the international market. In 2012 possible enter for a minimum of 32 new brands in Ukraine and Kiev. 28 of them will be presented in the SEC Ocean Plaza.